Our Bellevue Cosmetic Dentist, Cynthia Pauley DDS (second from right) is Inducted into the International College of Dentists. What is The International College of Dentists? 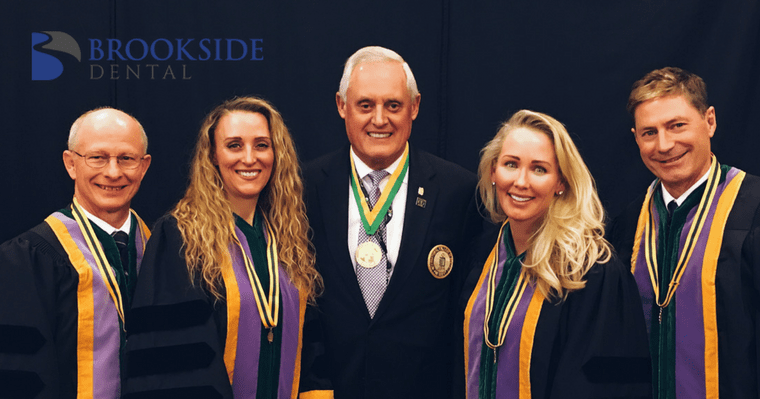 Cynthia Pauley DDS, Bellevue Cosmetic Dentist, has been inducted as a Fellow into the prestigious International College of Dentists at a ceremony held in Denver, CO. The International College of Dentists (ICD or “College”) is the world’s oldest and largest honor society for dentists™. This is the second international dentistry honor that Dr. Pauley has received. Previously, Dr. Cynthia Pauley was inducted as a Fellow into the prestigious Pierre Fauchard Academy for Dentists in July 2008. As a Cosmetic Dentist in Bellevue, Dr. Patricia Pauley was previously inducted as a Pierre Fauchard Academy Fellow in 2006. They became the first mother and daughter dentists to be inducted as Fellows into this international dental honor association. Does Being a Fellow of The International College of Dentists Mean? The importance of Dr. Pauley’s status as Fellow in this international institution is summarized in the statement that we provide world-class dental care for you and your family in the Bellevue, WA area. Conceived in 1920, the International College of Dentists as the oldest and largest dentistry honor society currently has over 12,000 members in 122 countries. These inducted members have been awarded the prestigious title of Fellow in the ICD. All members of the ICD regardless of their native language or country of residence, adhere to one universal motto, Recognizing Service and the Opportunity to Serve. These words define the International College of Dentists as well as the realization of the motto in our projects throughout the world. Dr. Cynthia Pauley has been a cosmetic dentist in Bellevue for twenty years and has served in a variety of positions including President of the Seattle King County Dental Society and President of the Washington State Dental Association. You can find the latest ICD news on the website in the Media Center, which lists the worldwide projects of ICD, the governance structure of ICD, the charitable fund program, as well as events and activities covering the entire global ICD community. Whether you are a Fellow of the College or an interested visitor, you are invited to use the website as your authoritative source of current information and ongoing projects from the World Headquarters of the International College of Dentists. For additional information, contact our ICD Fellow and cosmetic dentist in Bellevue, Dr. Cynthia Pauley at Brookside Dental, Bellevue, WA 98005.